After nearly 2 years of training, I completed my first Ironman! It was a long and sometimes difficult and very emotional road. With the support of so many people and training from Coach K and Brian, my dream came true. 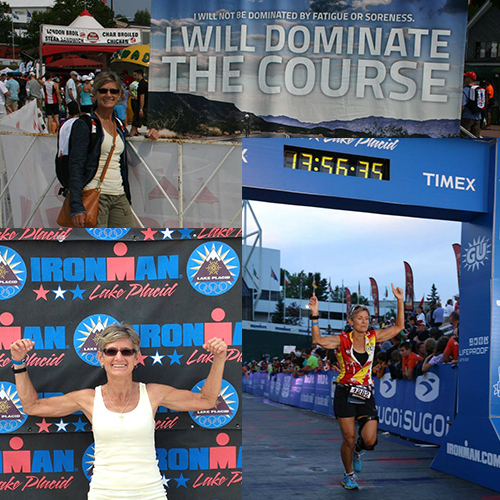 On July 27, 2014 I completed Ironman Lake Placid. The day started with rain, then thunder and lightning storms, and as I got on my bike it started to hail. Then, as if god was watching over us, the sun came out and I had the race of my life. Even typing this I still get emotional. I reached every goal that I had set for my self that day, it felt unbelievable. I finished 7 out of 33 women in my age group. I owe so much to Kristina; I believed in her coaching and proper nutrition and got it done somewhat painlessly. My recovery was awesome! I went hiking 2 days after and a bike ride on the 3rd day. Thanks again to everyone who came out to support me: Kristina and Matt Plachecki, Heather and Brent Morrison, Barb Hill, Chris Steeves, Brian Humphrey, Wayne and Colleen Cosby and girls, my sister and her husband, and most important my husband Gary!